As much as I dislike embroidered sarees, I love hand painted sarees and I paint most of my sarees myself like here, here, here and here. The one below is painted on pure khadi. It is a beautiful gold coloured khadi. It was 7th August 1905, when leaders of the freedom movement like Aurobindo Ghosh, Bal Gangadhar Tilak, Bipin Chandra Pal, Lala Lajpat Rai and several others started a Swadeshi Movement asking Indians to boycott all British products and use only those made in India. To commemorate this, it was decided in 2015 to observe August 7 as National Handloom Day every year. This was done to bring into focus the handloom sector, help the weavers and the karigars and make the common people aware of the 2,000-year-old rich history and heritage of handlooms. 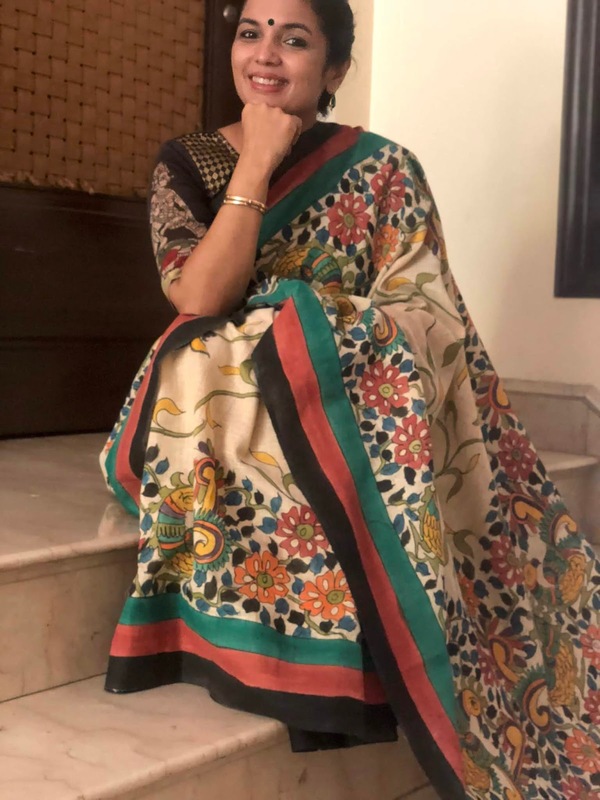 In 2016, Union Minister of Textiles Smriti Irani had started a #Iwearhandloom campaign inviting people to post pictures of themselves wearing handloom attire, while tagging five others. And social media users went berserk with lots of pictures being uploaded. But the question to be asked is–how does a one-day exhibition of handloom-clad people help the handloom sector? “No, it doesn’t,” says Jaya Jaitly, emphatically. 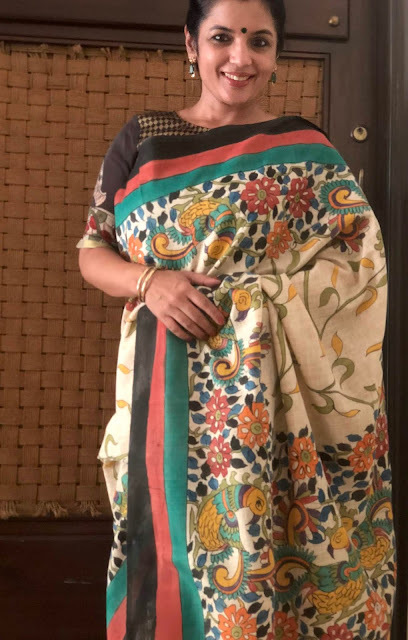 Politician and Founder of Dastkari Haat Samiti (arts and crafts market), she has been working with rural artisans of traditional Indian crafts and handloom weavers across the country since 1986. In India, the handloom sector employs more than 43 lakh people, directly or indirectly, contributing to more than 15% fabric production in the country. It is the second largest after the agricultural sector and plays a major role in the export business as well. Indian handloom sector holds a unique position as similar sectors all over the world has closed down. Except for very few countries, handloom products have almost vanished from world markets. Indian handlooms hold a major chunk in the handwoven fabric, 95% in the world. But this is not enough to sustain the sector. Faced with fewer returns on heavy labour, the younger generation of weavers is trying to find new avenues of work to get easy money. And so, an important and unique heritage sector is, unfortunately, facing existential problems. Maybe declaring one special day puts it in the same category of celebrating Mother’s Day, Friendship Day etc. It might sound trivial. But at least people, especially the young, who aren’t aware of what handlooms are, become aware of this sector. So the next time they go shopping, they might try out a handloom product, and once they experience the comfort of a natural fibre, they might become regular customers. There are many designers who use only handloom fabric and yarns in their designs. In fact, many of them stay with the weavers for months, urging them to experiment with colours, yarns, size of the fabrics etc., to get the desired designs and also to bring the weavers in the mainstream. And because of them, several handloom sectors like Chanderi, Ikat, Benarasi, Mekhlai, Kanjivaram, Paithani, Jamadani, Mekhla chadar etc. have got a lot of encouragement. Handprints like Kalamkari, Bandhani, Ajrak and Batik too, have been revived. With fashion designers stepping in with their ideas, handloom weavers have started experimenting. Previously, they wove only saris, chaddars and long lengths of fabric. They used only particular colours and yarns which were in practice for centuries as the handloom sector is still a family-run business as the art of weaving is passed on from one generation to the other. And even the public thought that handlooms meant only these products and so youngsters shun handlooms. Now, designers are teaching weavers to change, mix-and-match yarns, dyed yarns with different colours, weave different eclectic motifs other the traditional ones and even change the size of the looms to get the desired length of fabric, which is easier to use in Western attire, whereby there is a reduction in wastage of fabric. Several initiatives have been taken by the Government, but there is a lot more which needs to be done in a structured manner on various aspects to make a big impact for handloom revival. The new generation of handloom weavers is establishing better ways to communicate with clients. They are participating in a lot of exhibitions. The customers are more aware of every handloom that is shown to them and also are aware of its exclusivity. Thus the acceptance for handloom textile has increased, which has increased the scope for better pricing. Another major hurdle ailing the handloom sector is that couture fashion isn’t able to tap this sector. Couture is a big segment which is still untapped for the betterment of handloom. No one would like to stick to handloom if they are not making profits. If couture segment joins in, it will change the game. Government-led schemes such as the cluster handloom development programme for new product development and weaver training programmes seem very promising. Further, larger retail companies have now started to focus on developing brands made in the handloom sector. While designers have a voice that can influence change, their businesses are small and cater only to a niche segment. Mobilising the mass segment to show more interest and involvement in engaging and reviving this sector is critical for the immediate and mid-term future. In fact, many big industries have joined hands with IHB (India Handloom Brand) in sourcing high-quality handlooms and branding them to reach the customers. To revive the handloom sector, the state of Kerala has made it mandatory for all schools to get uniforms from handlooms. That’s a huge chunk of handloom fabric and work for weavers. If this gets replicated in all other states, things will change a lot for the weaving community. Whatever may be the problems, all the players in this sector agree that the handloom sector is certainly infused with a new lease on life. Now it’s up to the customers to support this sector, to buy handlooms (at least one handloom product for every five others you buy) and help our 2,000-year-old craft alive.